The ventless hood gives you the flexibility to “set up shop” just about anywhere from malls, stadiums and high-rise buildings to basement kitchens and kiosks. Griddle surface (17 1/4”W x 18 1/4”D) has enclosed tubular elements that provide even heat distribution. Griddle is controlled by a positive-off thermostat adjustable from 100ºF to 400ºF. 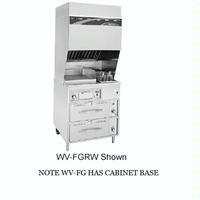 Griddle features include a full-width front grease trough, an extra-large removable front grease drawer and a stainless steel splashguard. Two half-size, rear hanging, interchangeable fry baskets are provided. Efficient heating element is flat, heavy-duty stainless steel. Fryer on/off switch is located in recessed front control panel. The positive-off thermostat controls the element allowing for adjustable and more consistent temperatures. The fryer has a manual reset safety thermostat that will shut off the heating element if an over-temperature condition is reached. Ventless Hood System exceeds EPA Standard 202 for the release of particulate matter. Interlock System will not allow heating elements to be energized if any of the filters are not in place. Ansul® R-102 Fire Suppression System is built into the ventless hood to provide ultimate protection. Shatter-resistent interior light for improved visibility. MANDATORY OWNER RESPONSIBILITY: Before any Wells Mfg. Ventless unit can be powered up for the first time, the included UL300 Ansul fire suppression system must be charged with "Ansulex" and commissioned and tagged by a certified and locally licensed ANSUL Fire Suppression contractor. This commissioning is also the commencement of an agreement between the Ansul agent and the owner and cannot be consummated by Wells Mfg, its agents, dealers or service agencies. Cost will vary by individual Ansul agent and paid by the owner, not by Wells. view A one-year warranty against defects covers parts and labor.